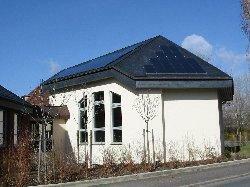 Summary As a retrofit the roof of church hall has been equipped with a two section PV generator. With the financial support of the “Deutsche Bundesstiftung Umwelt” and the “Energieagentur Dresden” it was possible to realize this PV system. In front of the building a display shows the generated energy and the carbon dioxide emission equivalent for the conventional energy mix.